The pictures really don’t do justice to this heavenly spot! 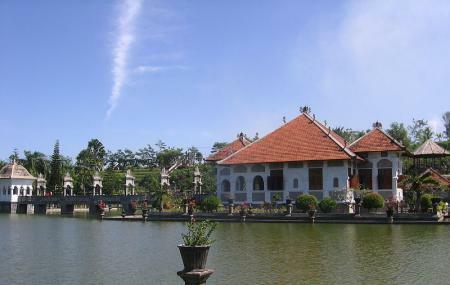 The Taman Ujung Water Palace is a delight for anyone who admires historical places. After volcanic ash destroyed the places in the late 70s, a restoration process had been taking place on the site. It is now more spectacular than ever, and a must see! The large palace complex, is surrounded by still water on all sides is truly a marvel and great to capture. As you enter the complex, the main building is right at the center of a large man-made pool, and there are lovely trees, plants and colorful flowers that give the place so much beauty. Overall, this is one place you’d want to add in your photo album! How popular is Taman Ujung? People normally club together Bukit Tirtagangga and Bukit Asah Bug Bug while planning their visit to Taman Ujung. 🥰 you should visit this place when you come to Karangasem. It is so beautiful place. There are some pictures of the King family in the palace. So wide, and green. Clean and cool. Very recommended place if you wanna have a special day and special moment here. Very nice. I loved being here. Unfortunately another place where they take advantage of tourists. 50000 entrance fee and same price for kids. If you have small children age 2 and 4 like us the pay half price where everywhere else is free. They deserve not to have tourists for a while. Parking 5000. Beautiful garden of King Karangesam converted to memorial garden. The memorial halls have some photos and brief information re the King. Fish pond surrounding the hall, there were 2 bridges connecting the hall. Walked up the staircase to the rest area provide astonishing view of the park. No drone allowed to fly within the park, heavy fine will be incurred. 50k per entry, ticket available at the counter.